...wearing stripes and navy blue. For some reasons I adore this combination, especially with my brown messenger bag. Though nothing can possibly fit in this tiny bag (I usually have all kind of things in my bag), I still love to carry it around. ...полоски и тёмно-синий цвет. Сама не знаю почему, но очень люблю это сочетание, особенно в паре с коричневой сумкой. Хотя в неё абсолютно ничего не помещается (я люблю, когда в сумке помещается абсолютно всё), я всё равно частенько её ношу. Me too i love stripes and navy blue! And in combination with the red scarf and the messenger bag it makes a great match! Congrats on the interview! You look so chic, love the whole look, especially the scarf and the bag! AMAZING photos! You look sooo pretty! This is such a classic look which never seems to date! Love the interview. And this look is great! LOVE this outfit! I agree, navy, stripes and brown are a perfect color combo! And I love the pop of red too! I love this outfit! It is so so gorgeous!! 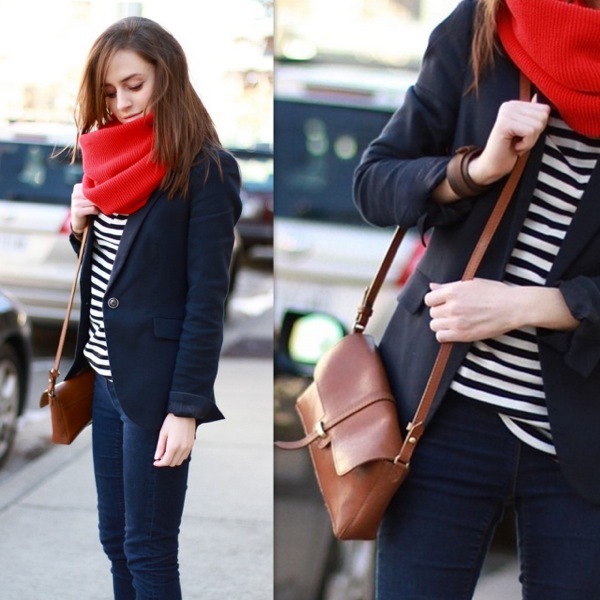 I love the navy and stripes combo - and the red scarf is such a perfect addition! That is such a chic combination. I love it. 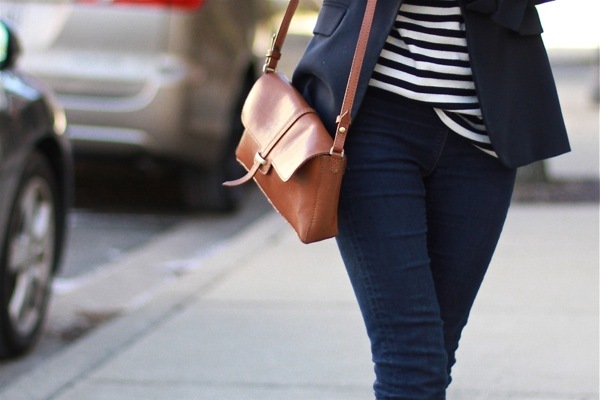 Ahh, such a comfy and delicious navy look, I love stripes too; and the bag and scarf details make it adorable! Cute classic look with a pop of color! Congrats on the interview! Love the combination!! Stripes are something I would wear most of the time! BTW, thank you so much for the activity on my blog! Love your blog! Love the pop of color. Classy and fabulous as always. great outfit, striped tops are one of my fave things ! Me encanta ese bolso y el rojo con navy.Guapísima como siempre. The outfit is just so lovely...you look adorable! love how you have paired the outfit with a bright red scarf!!! I love the nautical stripe and jean combination...it's such a timeless look ...I'm actually wearing it myself right now! This look is so timeless and chic! I'm loving your blog girl, I'm your newest follower! I hope you'll follow me back and we can keep in touch. I love discovering new blogs!